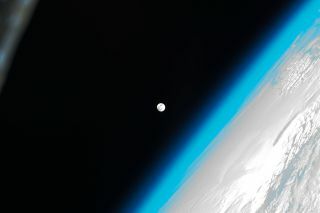 This photo of the full moon on Jan. 8, 2012 shows the moon as it appeared to astronauts on the International Space Station. It is one in a series of full moon photos by the station's Expedition 30 crew. The full moon of February will hit its peak Tuesday night (Feb. 7) in what Algonquin Native American tribes have traditionally called the Snow Moon since heavy snowfalls typically occur in the northern regions this month. This month's full moon occurs at 4:54 p.m. EST (2154 GMT), although the moon can appear full to casual observers a day before and after the exact time of its full phase. Just after sunset, the bright planets Venus and Jupiter are also putting on a celestial show for skywatchers with clear weather. The February full moon has many names, just as every month's big moon does. In addition to its Snow Moon nickname, the lunar event is also known as the Hunger Moon, Storm Moon and Candles Moon due to its occurrence during the northern winter season, when food could be scarce and the weather foul. The full moon for each month occurs when the moon is on the opposite side of Earth from the sun, so that its face is completely illuminated by sunlight. "The full moon rises around sunset and sets around sunrise, the only night in the month when the moon is in the sky all night long," wrote SPACE.com contributor Geoff Gaherty, an astronomer with the skywatching software developer Starry Night Education, in a February 2012 skywatching guide. Lunar eclipses can also occur during the full moon phase when part or the entire moon passes through the Earth's shadow. But since the moon, Earth and sun are not all exactly in the same plane of space, not every full moon creates a lunar eclipse. Tonight's full moon is not the only lunar sky show in February. The planets Venus and Jupiter will team up with the crescent moon later in the month on Feb. 25 and Feb. 26, when the three objects appear extremely close to each other in the evening sky. Venus is currently shining extra bright as a dazzling "evening star" just after sunset and will continue to do so all month long. Jupiter, meanwhile, is spending the month in the constellation Aries. Jupiter and Venus are currently the brightest objects in the night sky after the moon and Sirius, which is the brightest star in the sky.